The Gallery Weekend in Berlin has a relatively recent history as this year it celebrated its 9th birthday. The event, which this time around was even more well–organized than in previous years, was founded by a small group of gallerists, who have now become somewhat even more professional in what they do, since they had appointed Cédric Aurelle as a general manager. Certainly, Gallery Weekend Berlin is growing each year: the participating galleries this time were fifty-one in total, ranging from emerging to established. It was roughly estimated that around ten-thousand visitors were gallery–hopping throughout the Gallery Weekend. 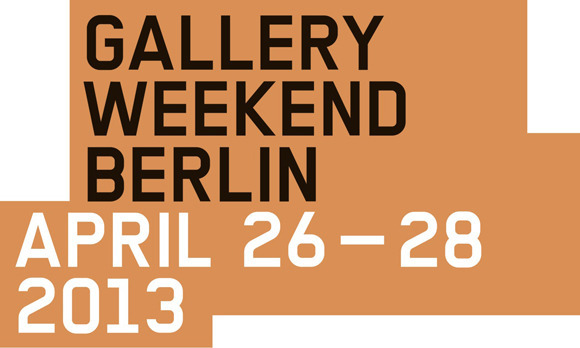 Without a doubt Gallery Weekend Berlin is an increasingly successful event, energizing the whole of Berlin’s cultural life in one springtime weekend. It is a ‘once a year snapshot’ of Berlin-based artists and galleries that this spring took place as fifty-one shows, most of which solo, in sixty-six venues. The Gallery Weekend was held this time between the 26-28th of April 2013. This year I happened to do my fair share of ‘gallery hopping’, which was more of a ‘conceptual hopping’, really, as I would lend my sensibilities to one art idea and would then very soon find myself indulging into another. I explored one chunk of participating galleries by hitting the streets of Potsdammerstraße/ Kurfürstenstraße. Doing this survey in one go was exhausting, yet very exciting. My first visit was Tanya Leighton Gallery. The exhibition on view was “The future was at her fingertips” by the Berlin-based artist Alexandra Domanovic. Domanovic’s exhibit is an interesting exploration of the ideas about technology that the ex-Yugoslav constellation of countries had and of how they envisioned their future together after the Second World War. Her work draws attention to one of the earliest attempts at developing an artificial limb with a sense of touch, known as the ‘Belgrade Hand’. 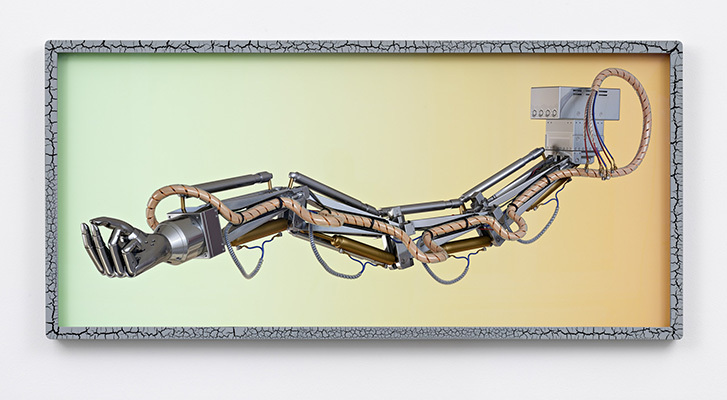 For her exhibition, Domanovic commissioned a fully–rigged computer model of the ‘Belgrade Hand’, from which she made five 3D–printed sculptures that allowed her to act out a variety of gestures. What one sees in the gallery are four hands cast through a laser sintering process. Three of them sit atop obelisk-shaped plinths, made of acrylic glass––a fourth is mounted on the wall. Two of the hands and the frame of a large ink–jet print, displayed in the back room, are coated with a layer of ‘Soft-Touch’: a polyurethane-based coating that feels like an organic surface (almost like leather) and is commonly used for cars’ interiors or book covers. The ‘Hands’ are exhibited at times in such an unexpected way––they resemble door knobs or handles of some sort, whose details are as if designed by futurists, who find excitement in the artistic possibilities of fluorescent colors. Just on the other side of the street from Tanya Leighton Gallery, insitu––a new contemporary art space, was launching itself in the art world. Insitu‘s inaugural concept, ‘Episode 0: Introducing insitu’, could be thought of as a way of reflecting on its possible identity as space per se. Within the framework of the Gallery Weekend Berlin, ‘Episode 0’, gave the artists Ulrich Vogl, Sinta Werner, and Ignacio Uriarte free reign over the transformation of the empty space and its structure into contemporary art. The exhibition space had two rooms, the second one of which was devoted to Uriarte. Uriarte’s project “1_2_3_4_3_2_1” is a sound installation, which plays on the sound made by eight different typewriting machines. The typewriters take turns as they raise the tempo of the rhythm. In his work, Uriarte infuses with life the monotonous sound of the typewriter, which would otherwise evoke not much more than the notion of tedium and exhausting labour. By vitalizing the monotony of typewriting, which has now become a nostalgic device for us because of the ‘technological revolution’, the artwork still manages to furnish the banal sounds of the daily office routine with a curious facet. Henri Chopin (1922-2008) was a French Dada poet––one of the key figures of the French avant-garde of the fifties and sixties. Supportico Lopez put on view the manuscript of Le Crevette Amoureuse, which is part of the trilogy of Le Dernier Roman du Monde, started in 1961. The manuscript was never printed out until 1994 when Peppe Morra, Chopin’s former gallerist, bought the manuscript. 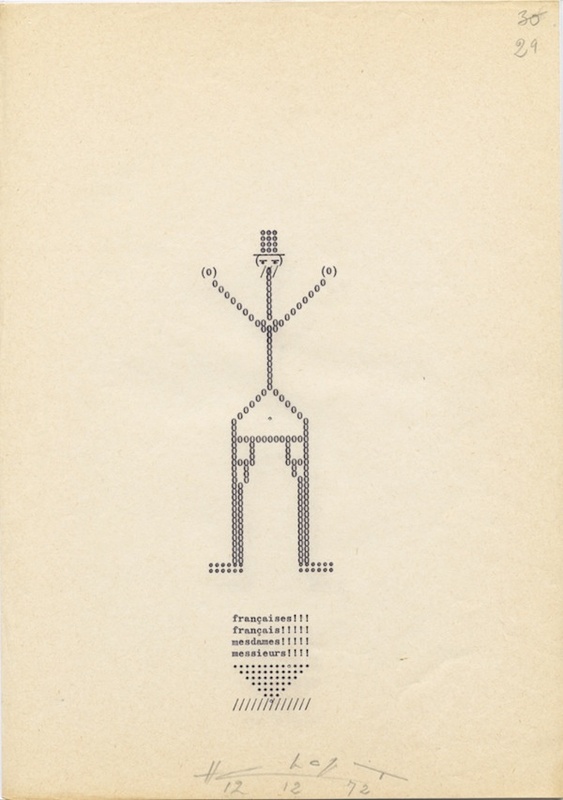 The 146–pages manuscript, modest and wonderful, is a text marked by the playfulness of Dada and backed up by abstract reason and dialectics. Oftentimes, one can see in the pages of this Dada Novel the typewriter’s red and black ribbon drawing characters and puzzles, full of abstractions–– sassy and quaint. In the back room of Supportico Lopez, two of Chopin’s sound-poetries were installed and available to the public’s ears. The poetries had no recognizable language––only sounds. Language in Chopin’s belief was capable only of lying and unable to express genuine ideas. Chopin tried to find the purest form of sound within the human body, which led him to do a very peculiar thing: he swallowed a microphone, which was supposed to allow him to capture the voice ‘in its most purest form’. What characterized the space the most, however, was that the space itself was replicating the effect of Chopin’s sound poetry. If one wanted to communicate the nature of the material one was listening to on the head-phones, the echo of the back room would make one’s uttered sounds resound like Dada poetry. Potsdammerstraße is a street that accommodates a large number of independent contemporary gallery exhibitions, but 9 TIMES PHILOSOPHY by Jorinde Voigt in Klosterfelde Gallery was one of the nicest discoveries that an ECLA of Bard student can come across. Voigt is one of those avid readers, who tries to integrate her enthusiasm within an art medium, which does not work with language, and whose signs certainly do not produce meaning in the order of language. 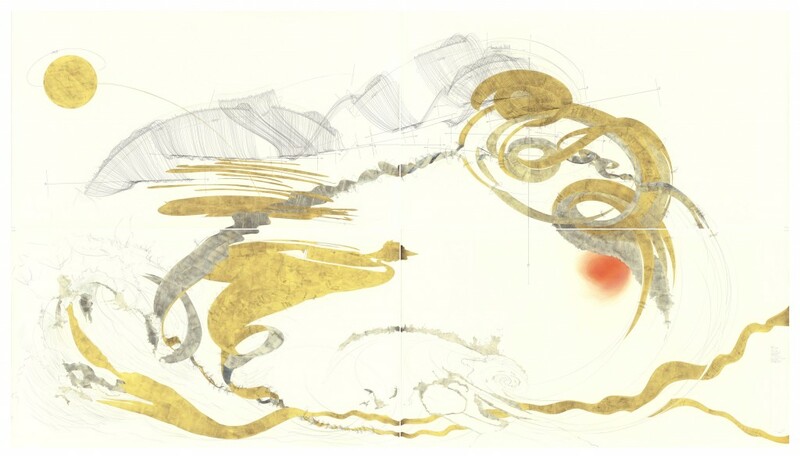 Nonetheless, her drawings are based on philosophical and literary texts. She has developed in them a coded form of writing, so as to transform these texts into visual compositions. Even though she is working with some complex texts and her own intricate ideas, she unites both in an orderly appearance. The erraticness of philosophical concepts in fact seems to bring order to her erratic ideas. In 9 TIMES PHILOSOPHY, Voigt creates her space of ideas and concepts by allowing the viewer to participate in her own experience of appropriation and her attempt to understand and close–read the texts at hand. Her paintings are like a dense network of notes; each surface is a drawing, or better put––a representation of quoted passages, which are supposed to reproduce a visual association in an avid reader like her.Voigt sketches these imaginary forms on paper, cuts them out, plates them in gold, and combines this inlay technique with handwritten notations, creating in this way surfaces which reflect on her subjective readings. The philosophical and literary texts that one encounters in these surfaces, visually interpreted by Jorinde Voigt, are Goethe’s “Prologue in Heaven” (Faust I), Epicurus’s “Letter to Menoeceus”, Kandinsky’s exchange of letters with Schoeneberg, works from Peter Sloterdijk, Plato, Elias Canneti, Paul Celan, and various haiku poems from the most eminent japanese poets. Another pleasant encounter in Potsdammerstraße was Douglas Gordon’s exhibition at Blain|Southern exhibition space. Gordon’s Sharpening Fantasy brings together his very recent video works. The video projects which were presented within Sharpening Fantasy (working title) were: In Full Circle, Unnatural History, Unnatural History II; Once Upon a Time Without the Sun; and Sharpening Fantasy (2012). These works give us a glimpse on what unsettles him, but also on what is to be unsettled. 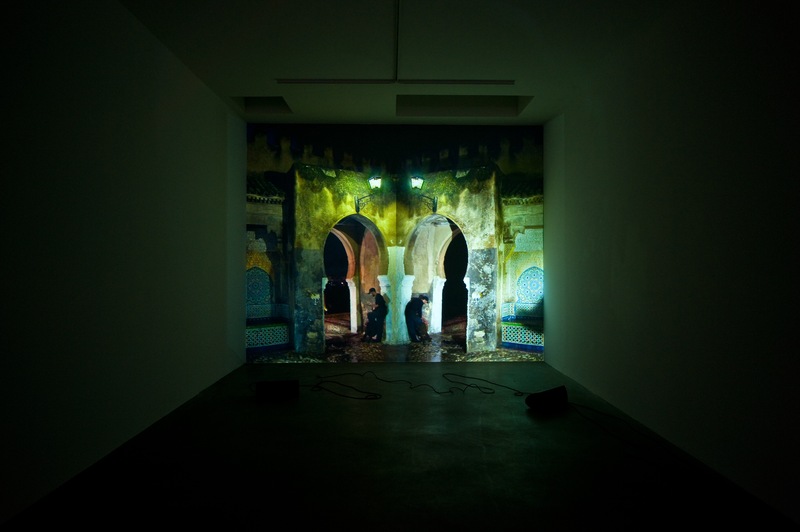 His videos––fragments from his travels to Morocco and Tangier, create that documentary setting that needs to “record things for what they are”. But Gordon is not after discoveries that stand out as otherworldly or as such that need to be documented––on the contrary, he is interested in blurring the divide that constructs the other. The exhibition as a whole is meant to challenge the polarities between Europe and the ‘Orient’, desire and fear, light and dark, and all the conventional ideas that define themselves through these oppositions. 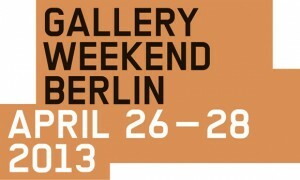 Do make sure to check out Gallery Weekend Berlin if you happen to be in the city during the spring. The development of the event throughout the years has shown that there is much to be expected. And even if you cannot visit all galleries and exhibitions on offer––every fragement of experience is a valuable and exciting one.